Washing large fleets separates efficient operations from small time operations. Generally speaking, the large fleet owner wants the whole fleet washed on time and inexpensively. When washing a lot of trucks you usually don’t spend time detailing. Everyone should experience washing one truck for an owner operator. Restoring aluminum tanks, brushing stacks, degreasing the rails, etc, etc., but don’t approach a large fleet using the same techniques! For one, they won’t pay for that level of service, and two; you probably don’t have the time to provide that level of service anyway. The point is usually to make the trucks shine so that the company president can look out the window at his fleet on Monday morning and have the sun reflect off the truck into his eyes, at which point he says ”man, those trucks are clean!” The problem most pressure wash operators encounter is that they can’t find the correct level of clean. Either they do such a lousy job, that even the boss from the window can see that the trucks look bad, or they hand scrub every inch of every truck and can’t make a living. There is a middle ground that must be found to succeed. The middle ground is usually found by either working with the proper pressure, temperature, and chemical, or by throwing manpower (brushers) at the fleet. The most successful are the companies that work smart, not hard. 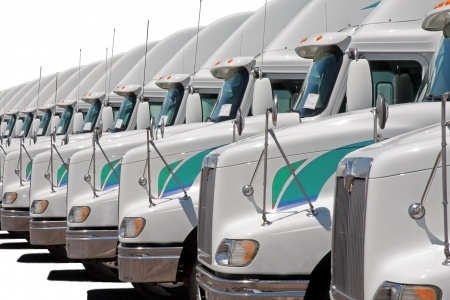 Working smart on a large fleet that is washed on a schedule can be very profitable. Many laugh at the low prices that are charged to wash large fleets, and of course there has to be a bottom line limit to pricing. But consider washing tractors all day at $12.00 each. Wash four per hour and you’re starving. Wash ten per hour, per person, and now you’re making a living. Working smart should allow you to do this. EnviroSpec has several chemical products to use in truck washing. There are differences between them that will make some more suitable for you than others. These differences should be examined in the catalog. Some are targeted on certain vehicle types, some work better when washing with cold water, etc. Prodigy, our ‘first-born’ is our ZP-1 SuperFlo Polymer Base. It combines excellent cleaning, rinsing, and gloss enhancement and has been our industry’s #1 selling truck wash for over 20 years. Bond Breaker includes an electromagnetic release additive that result in a ‘film-free’ touch free wash. Mr. Muscle provides an additional amount of ZP-1 base and solvents for degreasing. It also contains quick rinse additives and ‘gloss enhancers.’ All the above chemical products are phosphate free. They should all be tried and you should establish which product is best for you, the fleets you wash, the conditions you are washing in, and your washing style. Next you move into the phosphate family of detergents. These include Pro Blend, Nitro, Release & Viper. This group of detergents has a slightly lower Ph level. This can sometimes be beneficial in the heat of summer on dark trucks. Each product is formulated to work best in certain conditions on certain vehicle types. Some products overlap and they should be tried to determine which is best for your individual needs. Again, as with the other chemicals, refer to the catalog for the most specific information on each product. Any of these truck wash chemicals can also be used in a ‘two step’ cleaning process or on their own. Many companies practice this method of washing. They use minimal chemical and brush about everything every time. Anyone that has spent a day brushing trucks knows that this isn’t something that you want to do all the time. It is physically exhausting and slow. So to accomplish this – companies bring in a lot of people. While no method is wrong, I have to question how well these companies do. The bright side is that they are providing employment for so many people. But when two people can wash that same fleet in less time than the six people, and without brushing anything, it doesn’t seem fair. Paying people will always be more expensive then using EnviroSpec chemicals. Don’t scrimp on equipment. While PSI is important, flow is even more so. It is generally agreed that fleet washing is best performed within a pressure range of 1800 to 2200 PSI. But you have to have the flow to back that pressure up. Work with a minimum of 5.5 GPM. More is much better, but the limiting factor is water supply. If you use more water than you can pick up you lose any gains while you sit waiting for the water supply to catch up. Water flow puts the punch in the pressure as well as providing rapid rinsing ability. For scheduled fleet washing the ability to rinse the chemical off the vehicles is what makes you fast or slow. Don’t scrimp on chemical. Even if you blow through a 55 gallon drum of detergent in one day, you would be looking at a profit ratio of at least ten times your chemical cost. This is the worst possible scenario. You won’t use that much chemical. The SuperFlo Polymer chemical you use will provide that ‘shine’ you want the customer to see, without the brushing that eventually will wear you out. Don’t scrimp on heat, but use it smart. The weather determines the proper water temperature to use when washing. Chemical works best when it’s warm. On a hot day, the vehicle surface is hot enough and you should run cold. Below sixty degrees start using heat. Between forty and sixty degrees, use a water temperature between 110 and 130 degrees. Below forty degrees increase the water temperature up to 150 degrees. Never go over 150 degrees unless your forced to by extremely cold temperatures. In other words, if the chemical has frozen hard to the surface, turn the heat up to melt it off. With that one exception, keep in mind that 150 degrees should be the top end for the water temperature. Higher temperatures begin to deteriorate any detergent’s performance. Apply chemical through a downstream injector onto the surface. Never apply beyond the amount of surface that can be washed and rinsed prior to chemical drying. Wash the chemical from the surface. Watch to see how close you need the nozzle to be to the surface. On dirtier trucks, wash fairly close in and pattern clean so you don’t miss any of the surfaces. On cleaner vehicles, work farther away from the surface. Work from the top to bottom and for quickest rinsing add 1-gallon of our Speed-X-777 to your 55 gallon drum of detergent and cut your rinse time by up to 70%.